Guest Post: John O’Brien, Author of the “A New World” Series! I’ve been in the foment as of late, and have not been readily available to amaze and astonish you with my wit and wisdom. Acting in my stead today is a real steely-eyed killer you might have heard of. Let’s meet…former AFSOC superstar (?) John O’Brien! Hello there. 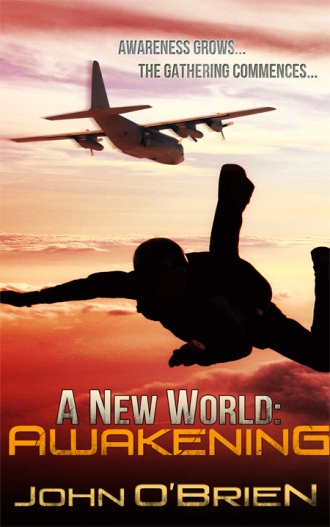 My name is John O’Brien and I’m the author of the series, A New World. I released the fifth book, “A New World: Awakening”, a couple of months ago and am starting on the sixth book tentatively titled “A New World: Dissension”. That’s an interesting and one I might have answered no to a short time ago. However, you only have to see the news to know that, it’s not really an ‘if’ to some form of apocalypse happening, but ‘when’ and in what form. Now, first of all, I am no expert by any stretch of the imagination. There are many much more knowledgeable than I. I know, hard to believe. However, some of the three brain cells left roaming around in my head to collide and form a thought. Some of those thoughts are best left inside although they do occasionally come out in the form of blurting out something inane. Well, there’s me digressing again. A common occurrence. So, let’s look at the various forms that could bring about the downfall. Or change if you’d like to call it that. There’s natural disasters, economic collapse, rebellion, viral pandemic to include the ever so popular flu vaccine. Ha, not so far-fetched now eh? The natural disaster would have to be one that affects us globally. Polar ice caps melting, the Yellowstone Caldera deciding to vent (pun intended). Yep, again not so far-fetched. The earth’s crust slipping. It’s happening. Magnetic north is changing in ever-increasing increments. All not fun stuff. No thanks to those. Economic collapse. Entirely possible. Chaos in the streets but the powers that be and the military will be viable and bring military law into power. Again, no thanks. So, let’s talk viral. And by that I also mean the vaccinations. We’ve seen the truth in those recently. Viruses do mutate, some quickly and others over time but they all mutate. Just look at the strains emerging today. They adapt and overcome and we are hard-pressed to find medicines to keep up with them. We are even having a hard time keeping up with antibiotics for the drug-resistant strains of bacteria. Cool, the Zombie Apocalypse can and will happen. Not so fast. Most likely not but something like the rage virus. Well, hmmmm….. The brain is a wired object, meaning, rewire it and it changes. It all works as a single entity and so block something and it changes what it was. Too high of a fever, parts of the brain are burned. Viruses invading and taking over certain parts of the brain and there’s now a different person, with different actions and reactions, based on the viral makeup and what they take over. There also has to be a survival aspect to viruses or they wouldn’t mutate to survive. Yes, I know it’s through ones that survive and have a partial immunity but the viruses adapt and change. They can even adapt and change to treatments on the fly. That’s survival. With survival, wouldn’t there be a propagation aspect? So, there are a few ingredients. They won’t technically be zombies but they will seek food and need to propagate to survive. How fast they are and to what degree they can think will be determined by what parts of the brain are affected. Far-fetched. Probably. Government super soldier, tough yet obedient, fearless, numb in the brain so they’ll take any order – not too far-fetched. Lots of homeless around. A trial version escaping – not too far-fetched. So, as you look upon the ghouls prowling the streets come the end of the month, know it’s not all that far-fetched. Thank you for spending some time with me and have a Happy Halloween. Folks, I’ll be back soon with a long-winded post of my own. Will need some time to write it…it’s epic.